A report released by the Center on Budget and Policy Priorities recently showed that New Mexico has cut per-student higher education funding by $4,588 since 2008. That’s a deeper cut than all but two other states. These funding cuts caused tuition to climb by an average of 25 percent since the recession and could mean serious consequences for New Mexico students. How did this happen? Well, as our state slid into the recession, rather than choosing a balanced response to falling revenues that included both funding decreases and strategic revenue increases, New Mexico, like most states, relied almost solely on spending cuts to balance the budget. As a result, higher education funding was slashed, and universities responded by raising tuition and fees for students. The budget was balanced, but partly on the back of New Mexico college students. Since 1973, public college tuition has grown by nearly 300 percent, but median household income has grown by only 5 percent. 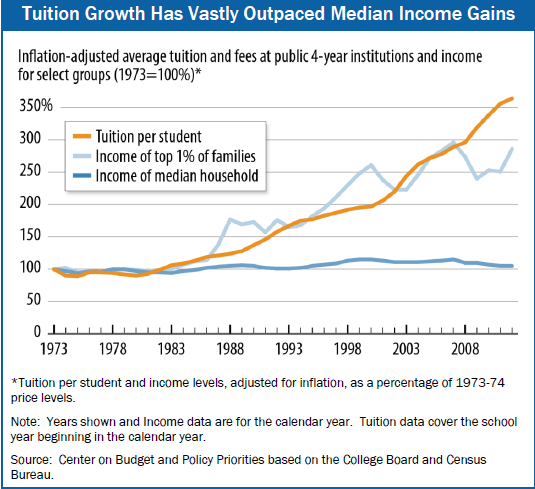 So, tuition has been skyrocketing at the same time that wages have been stagnant for all but the wealthiest earners, as this graphic shows. Students in New Mexico and across the country are now facing bigger hurdles than ever when it comes to financing their college educations. As states cut higher education funding, universities raise tuition and fees. As costs go up, students—especially those that are low-income—are forced to finance their education through loans. Growing student loan debt is made more difficult to repay due to rising interest rates. Like a snowball rolling down a hill, these barriers build on one another and are threatening to run over college students. In New Mexico, those most in danger of being run over are low-income students who can’t keep up with rising costs, working students (who are unable to meet the now full-time requirements for the lottery scholarship), and a disproportionate number of minority students. Our state’s kids are ranked last in the nation in child well-being, our economy is flat, and nearly 20 percent of our families live in poverty. On top of that, according to the Working Poor Families Project, while more than half of New Mexico’s working poor families have parents with no post-secondary education, it is tough for these parents to take college courses and move into better-paying jobs because only 25 percent of our state financial aid is need-based. Our policies, budget cuts, and tuition increases are not only holding back those who need an affordable college education the most, but also hampering New Mexico’s ability to develop a highly skilled workforce that can attract the businesses we desperately need to build our flailing economy. But the news isn’t all bad. In fiscal year 2015, for the third year in a row, the state increased higher education funding, though by only a very small amount (about 5 percent). Lawmakers also provided a temporary patch to the lottery scholarship fund, but we are still far below pre-recession, per-student spending, and low-income, working, and minority students will continue to be hard-hit from decreased spending and increasing tuition unless serious improvements are made. These improvements can begin with the lottery scholarship. The lottery scholarship should be need-based so that its limited funds go to those who need help the most and who face the biggest financial barriers to getting a college education. We should also consider restoring the College Affordability Fund, which had a $100 million balance prior to being raided for funds during the recession. Just as importantly, we must prevent future cuts to education budgets. New Mexico needs to reject further calls for more corporate tax breaks and consider new revenue options. We need to invest in our kids and our future by making education high-quality, accessible, and affordable. Amber Wallin is a Research and Policy Analyst with NM Voices for Children. Reach her at awallin@nmvoices.org.